ww2dbaseAlexander Alexandrovich Novikov was born in Kostroma Oblast in the Russian Empire. In 1919, he enlisted in the Red Army as an infantryman, and in the following year he became a party member. In Mar 1921, he saw action on the side of the Bolsheviks (with 384th Regiment, Soviet 7th Army) during the Kronstadt rebellion. In 1922, he served as a platoon commander in the Caucasus region of southern Russia, tasked with suppressing anti-Soviet guerrilla fighters. In 1930, he graduated from the M. V. Frunze Military Academy in Moscow, Russia. Three years later, he departed from the Red Army and joined the Soviet Air Force, where he would remain for the rest of his military career. Between 1933 and 1935, he was the chief of operations, then until 1937 the commanding officer of a light bomber squadron. In 1937, he was briefly expelled from the party and the air force during a purge. 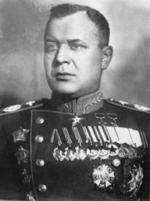 Between 1939 and 1940, he served as the chief of the air force staff of the Leningrad Military District, in which role he participated in the planning and execution of the Winter War with Finland; for his involvement in the Winter War, he was promoted to the rank of major general and was awarded the Order of Lenin. When German turned on the Soviet Union in 1941, still with the Leningrad Military District, Novikov helped in the coordination of air attacks against the rapidly advancing German front lines. In Jul 1941, his authority expanded to cover air units of the Northern Front, Northwestern Front, and the Baltic Fleet. Between Feb and 11 Apr 1942, he served as the First Deputy to the Air Force Commander. Subsequently, he became the Commander of the Red Army Air Force and Deputy to the People's Commissar of Defense of the USSR for Aviation. In this leadership role, he was given credit for the reorganization of Soviet air units that allowed major victories such as Stalingrad, Kursk, and Königsberg. For being able to overwhelm German forces at Königsberg, Novikov was made a Hero of the Soviet Union. Later, for his successes in conducting successful air campaigns against Japanese ground troops in northeastern China and Korea in the final days of WW2, he was made a Hero of the Soviet Union a second time. In 1946, upon discovering that the United States operated reconnaissance aircraft with much greater capability than those of the Soviets, the Politburo arrested Novikov. He was interrogated and tortured, and was made a tool in Lavrentiy Beria's campaign against his political opponent Georgy Zhukov. He was sentenced to 15 years of hard labor, but was released in 1953 after the death of Joseph Stalin. Shortly after, he returned to air force leadership as the Chief Marshal of Aviation. Now answering to Nikita Khrushchev, Novikov drafted plans for equipping a fleet of jet aircraft with nuclear weapons, but this plan was rejected by Khrushchev, who preferred ballistic missiles. Novikov retired from military service in 1958. He was awarded the Order of the Red Banner in 1961. Prior to his passing in 1976, he worked as the head of the Higher Civil Aviation School in Leningrad, worked as a university professor, and wrote several books on military aviation. 19 Nov 1902 Alexander Novikov was born in the village of Kryukovo, Nerekhta, Kostroma Oblast, Russia; his birth date was listed as 6 Nov 1902 in the Russian Old Style calendar. 11 Apr 1942 Alexander Novikov stepped down as the First Deputy to the Air Force Commander. 24 Jun 1944 Alexander Novikov was awarded the Legion of Merit by the United States. 16 Jan 1946 Alexander Novikov submitted plans for a reorganization of the Soviet Air Force to Joseph Stalin. 22 Apr 1946 Alexander Novikov was stripped of his rank and was arrested for failing to produce reconnaissance aircraft matching those of the United States. 23 Apr 1946 Alexander Novikov was tortured under imprisonment. 8 May 1946 Alexander Novikov was tortured under imprisonment, leading to a forced confession and being sentenced to a labor camp. 3 Dec 1976 Alexander Novikov passed away in Moscow, Russia.